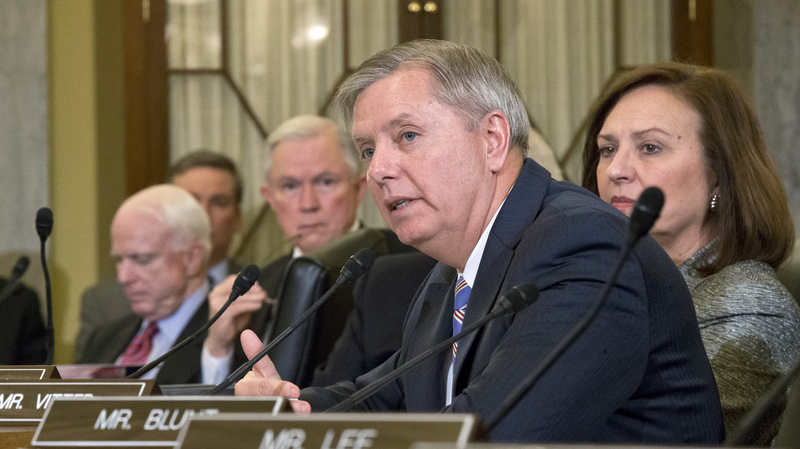 Senate Decisions Could Put Lindsey Graham's Seat At Risk : It's All Politics The South Carolina Republican has been outspoken in his criticism of President Obama's administration lately, particularly his opposition to Chuck Hagel as secretary of defense. But this may have to do more with a possible primary challenge than the nomination itself. Sen. Lindsey Graham of South Carolina voices his opposition to President Obama's choice of former Sen. Chuck Hagel of Nebraska as secretary of defense, on Capitol Hill last week. "There are some legitimate concerns to be asked about Benghazi ... [and] Chuck Hagel," says Tom Davis, a Republican state senator in South Carolina. "That being said, I do think it is fair to say that there has been a conscious effort on the part of Sen. Graham to elevate his role in those debates." Davis says that masks votes Graham has taken that conflict with small-government ideals. Graham voted for the bank bailout, once worked on climate change legislation and voted for the recent fiscal cliff deal that allowed taxes to rise on the wealthiest Americans. "All of those things have caused individuals to wonder whether or not [Graham] is representative of the type of conservative or the type of Republican that we need in Washington, D.C., right now," he says. For a while, Davis was discussed as a possible primary challenger, but he bowed out to focus on his agenda as a state senator. Bill Storey, a retired engineer in South Carolina, says he's not too pleased with the company Graham keeps. "I am not a fan of John McCain and never have been, and [Graham] allies too much with McCain I think," Storey says. Graham is widely praised for his constituent services, and his campaign war chest is formidable. He already has $4 million cash on hand, and that is why political consultant Chip Felkel doesn't think Graham has much to worry about. "He may have opposition from some corners on the right, but at the end of the day it's going to be more talk and less walk," Felkel says. So far, the conservative Club for Growth, a political action committee often a king-maker in Republican primaries, is still just watching South Carolina.